Two iconic names have come together to create this LEGO Star Wars set. A great addition to any LEGO collection, this set allows you to recreate favourite scenes from the Star Wars: Clone Wars animated series. LEGO model number: 75002: The 501st Clone Trooper is on patrol with Star Wars: The Clone Wars edition Yoda and the powerful AT-RT walker when he spots a Commando Droid captain and Sniper Droid. Use the AT-RT turning laser cannon to attack . Take your blasters out of the AT-RTs weapon storage compartment and open fire. Includes 3 LEGO Star Wars minifigures with assorted weapons: Clone Wars edition Yoda, 501st Clone Trooper and Commando Droid captain. For ages 7 years and over; EAN: 5702014974906. WARNING(S): Not suitable for children under 3 years old. 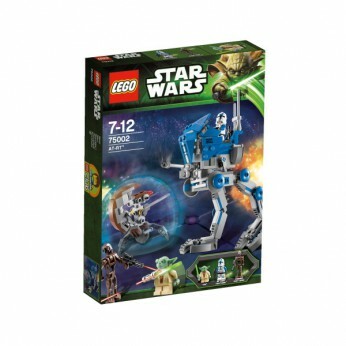 This toy costs approximately £19.99 (for the latest and best prices make sure you check our retailer list for the LEGO Star Wars AT-RT 75002 above). In our review of LEGO Star Wars AT-RT 75002 we classed it as being suitable for ages 6 years, 7 years, 8 years, 9 years, over 10 years but recommend you check the manufacturer specific advice before purchasing.